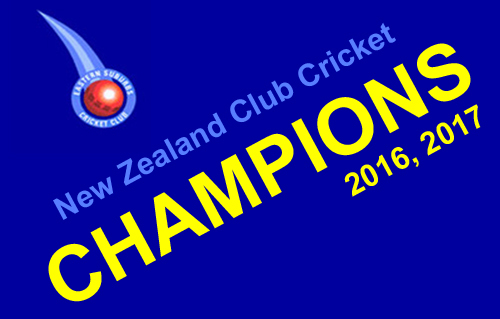 The creme of New Zealand’s club cricketers descends on Cornwall Park from April 10th - 15th to battle it out for the title of National Club Champion. 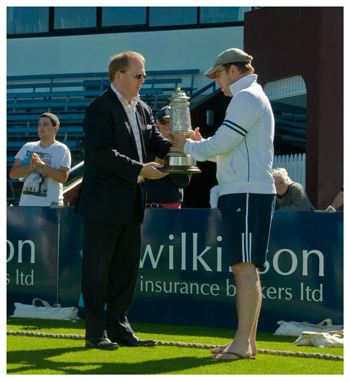 A tournament hosted and run by the Cornwall Cricket Club, it includes the one day champions from each major Association. The MIGHTY EASTS have qualified to be Wellington’s representative and they’ll be joined by Takapuna (Auckland), Otoumaetai Cadets (Northern), United Palmerston North (Central), Easts (Wellington), St Albans (Canterbury) and Taieri (Otago). 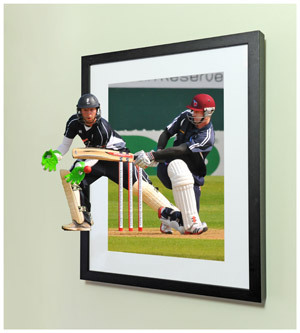 The tournament consists of five day’s of round robin play with a finals day on Sunday 15th April. .... DominionPost - "Easts' hopes go west with poor batting"
Another outstanding year for the Eastern Surburbs Cricket Club by winning back the Wilkinson Pearce Cup, five trophies and three East teams in first place in competitions along with the retention of the Cook Shield by the Premier Men’s team for another season. Cook Shield The Premier Men’s competition that runs much like rugby’s Ranfurly Shield with clubs having to beat the holders outright over two days to win it. We have successfully defended this 28 times now. 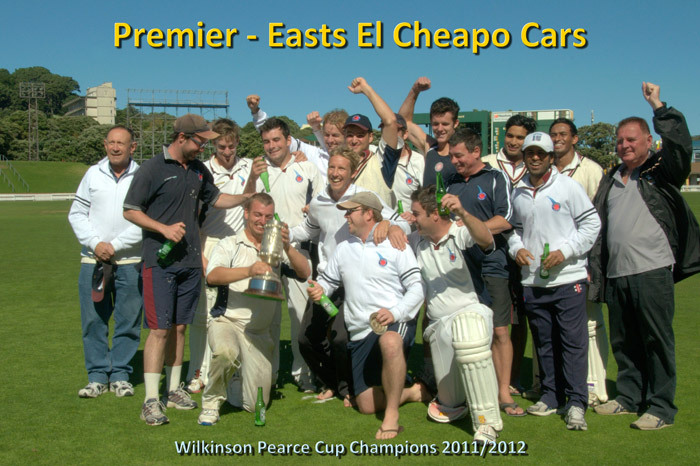 "The MIGHTY EASTS"have secured the Wilkinson Pearce Cup for 2011/12. After losing it to Karori last year we had a poor start to this season with being bottom of the table after 5 rounds but then the wheel turned and we achieved top qualifier for the final at the Hawkins Basin Reserve against Naenae. A comprehensive 9 wicket victory on day three has meant that the Pearce Cup is back home where it belongs. This now means that THE MIGHTY EASTS PREMIER TEAM have won this trophy for 10 of the last 11 years. Congratulations to Lance Dry (Captain) and your team and Management. Lance won the toss and elected to bowl at Naenae. 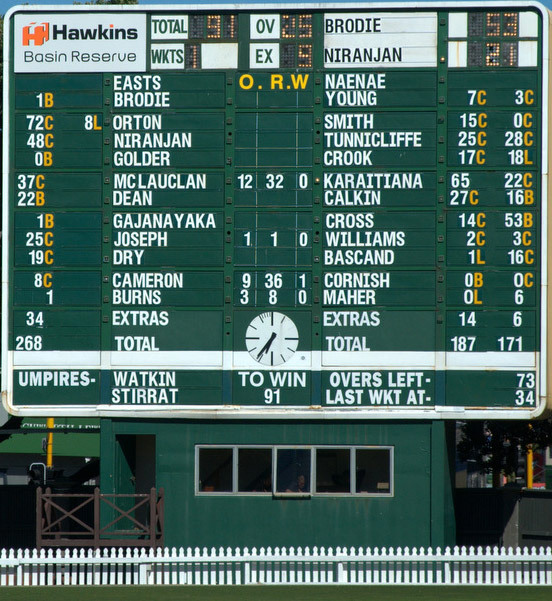 Soon after Easts had them in trouble and eventually dismissed them for 187 in the 1st innings. Wicket-takers were Michael Burns 3-53, Nathan Cameron 3-71 and Lance Dry 3-13. In response a 112 parntership between Ben Orton 72 & Niranjan Naguleswaran 48 got Easts off to a good start. Sam Mclauchlan also contributed a good 37 in a first innings total of 268. Surprisingly Naenae were not as agressive, as expected, in their 2nd innings and were contained with some consistent off stump bowling. Best bowling in the 2nd innings was Michael Burns 3-49, Ricky Joseph 3-53 and Nathan Cameron 3-49. Naenae were dismissed for 171 and this left Easts to score 91 to win the game. The Mighty Easts achieved the target set before lunch , on day 3, with not much effort with Josh Brodie scoring 53* and Niranjan Naguleswaran 21*. The 9-wicket win equalled their biggest winning margin in a Pearce Cup final, also beating Naenae by 9 wickets in the 2006-07 final. After starting the year losing their first four Twenty20 games the Premier Team have bounced back to be the leaders in the competition and securing a place in the 3 day final against Naenae. 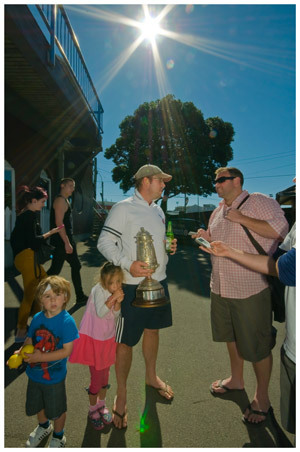 The final is to be played at the Basin Reserve from Friday 6th - 8th April 2012 so get out there to support Lance Dry and his Premier team to win back the Wilkinson Pearce Cup that they lost to Karori last year. The Premier team has also continued to defend the Cook Shield for two day games, home and away, and can put that away for another season. Successful defenses now total 28 ( 4 years ). BRODIE GOES BIG FOR WELLINGTON - "Third day Josh Brodie day"
Josh Brodie scored his second consecutive first-class century, his fourth overall for Wellington and his maiden double ton. His 210 was Wellington’s 20th first-class double century, the 15th by one individual and the 14th highest score ever by a Wellington batsman. Aside from helping Wellington post 479, which gave them a first innings lead of 159 over Auckland, one of Brodie’s other sources of satisfaction was that he’d seen off Blackcap Chris Martin. Noted for his ability to dismiss left-handers, Martin couldn’t get Brodie in his 29 wicket-less overs. Josh batted for 8 hours 27 minutes and had faced 394 balls. Josh scored 25* in his second innings off 29 balls and Wellington Firebirds a 7 wicket win against the Auckland Aces. Josh Brodie had good reason to panic when North City opening bowler Hamish Kyne struck him on the wrist on Saturday 11 February. The Eastern Suburbs and Wellington opening batsman had broken his left index finger at about this stage of each of the past two seasons. So when Kyne hit him with the second ball of the Pearce Cup match at Kilbirnie Park, Brodie immediately feared the worst. "I was like `oh God, three years in a row'," Brodie said. "I went straight to the hospital and got an X-ray and got the all clear. Josh is certainly on track to prove his worth with his first game 6 days later, scoring 50 in the 1st innings and completing a century in the 2nd - 116. Well done Josh for steering the Firebirds to victory!!! 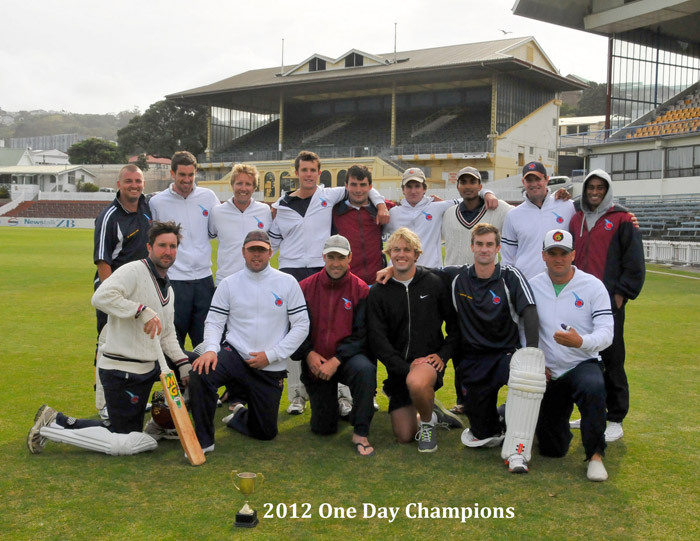 Easts Premier team played Karori at the Hawkins Basin Reserve in the Wilkinson Pearce Cup One Day Final on Sunday. Easts came away with a comprehensive win and will now represent Wellington in the National One Day Championship, in Auckland at Easter. Karori won the toss and elected to bat first. Some excellent all round bowling restricted their runs with youngsters Jamie Gibson & Sean O’Connor returning good results of 10-0-26-1 and 10-1-20-0. Ricky Joseph got 3-37 off 10 and captain Lance Dry & Mike Burns got 2 wickets each. Josh Brodie carried his bat through the innings once again ending on 64 not out with Scott Golder & Sam Mclauchlan were the other main contributors with 49 and 44 not out. The turning point in the run chase was 18 runs scored by Scott Golder, off Simon Baker’s over directly after the 25 over drinks break. Unfortunately Scott was caught on the last ball of that over but Sam Mclauchlan came in and continued the momento. Well done Premier Team !!!! Get to the Basin on Sunday to support the Mighty Easts Premier Team. Scott Pender, a former longstanding Senior player at Easts, is now a Registered Osteopath, ACC Provider. Scott’s goal is to return injured players back into the game we love, because afterall, it’s much more fun playing cricket than wishing you could be. Scott is offering a discount for club members who have paid their fees. The junior registration day will be held on September 24th at Wellington Indoor Sports Centre, Newtown from 10:30am to 12:30pm.